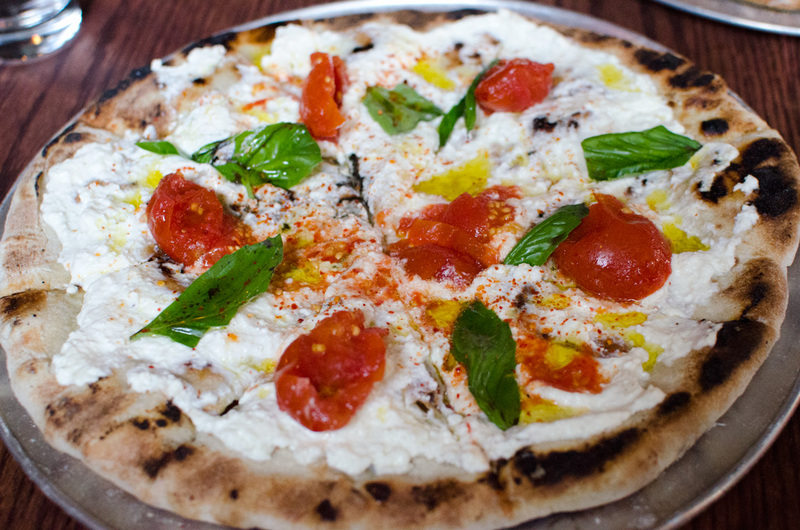 They take a lot of pride in what they do at Speedy Romeo, the new pizza joint in Clinton Hill. When I met for dinner with my friends Jess & Garrett our server explained that the food is cooked either on the grill or in the pizza oven, they don’t use gas to cook. The peppers that filled the cute jar were pickled in-house. It’s just too bad I didn’t enjoy my pizza more. I went with the restaurant’s namesake, the Speedy Romeo, a grilled pizza topped with ricotta, tomato, chili oil, and lemon. Our server had told us that the pizza wasn’t piping hot; the dough is topped with the fresh ingredients after being grilled, so it would be merely warm. It would not, she said, be cold. That may have been true if it had been served just after being made, but I watched the pizza cool as we waited for Jess & Garrett’s pizzas, and by the time it arrived in front of me it was most definitely cold. The crust was nicely seasoned and the ricotta and lemon made a nice pair, but the cold tomatoes were off-putting. I did enjoy the fresh mozzarella in my appetizer, paired with more chili oil and smoked eggplant on a big crusty piece of bread. I’d be willing to try one of their more conventional pizzas, and I usually do order the margherita as a litmus test for pizza places, but I don’t plan on making another trip there any time soon. This entry was posted in clinton hill and tagged clinton hill, pizza, speedy romeo. Bookmark the permalink.